New Pohaku Tenor size ukulele made out of very curly Hawaiian Big Island Koa. It’s appointed in the old fashioned style with wooden ‘Rope’ edge binding, rosette and the maple ‘mustache’ inlay. This style could be reminiscent of the early Hawaiian instruments or of old Cowboy guitars. My intention as a builder is somewhere in-between. The wood is reddish - golden colored curly and quarter sawn koa finished in a smooth and shiny lacquer. The fingerboard is a streaky piece of black ebony with maple bar fret markers which have blood red with brass position dots. The tuners are the new style PegHed Brand 4:1 ratio planetary tuners which are nickel plated with ivoroid buttons. they are super smooth tuning machines. This is a loud tenor with great note separation making it wonderful for picking as well as for strumming. 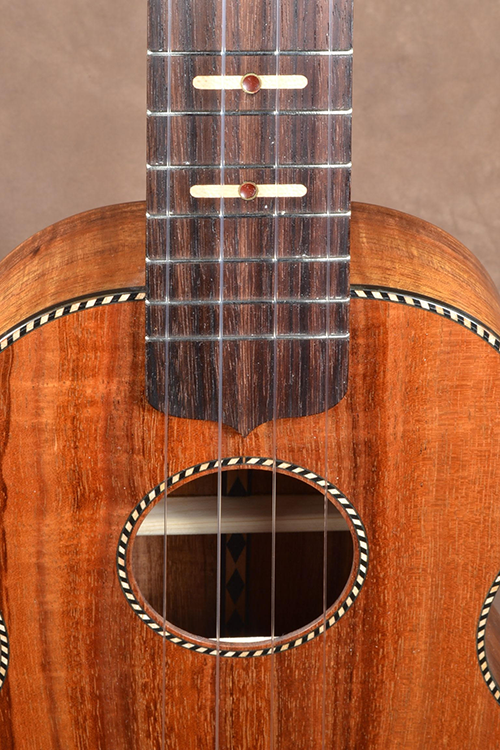 All the perfection that makes Pohaku Ukuleles meticulously built instruments can be found in this beauty. The instrument weighs approximately 22 ozs and is approximately 27” long.